Breathing. It’s something we rarely think about, really. What’s to think about, after all? I mean, we breathe in, we breathe out. That’s all there is to it, right? But did you know there’s breathing, and then there’s breathing? Breathing properly is breathing all the way down into the belly. In our fast paced society, we have developed a nation of shallow breathers. People who breathe mostly from the upper chest area. And when we do that, oxygen is no getting down into the places where we most need it. 2. The lymph system flows more easily, helping to get rid of toxins so that the body can heal itself. 4. Calms the nervous system – you might have already heard that a good solution for nerves is taking deep breaths. 5. Gives the immune system more energy to keep the body in high function. 6. Circulation system works more efficiently – increasing oxygen to the heart, allowing freshly oxygenated blood to circulate throughout the body, relieving congestion. These are only a few of the many, many health benefits of learning how to breathe properly. Being to notice how you breathe. When you are breathing properly, your tummy should rise on the in-breath, and fall on the out-breathe. If you find when you are breathing that only your chest is rising, then begin to intentionally take deep, cleansing breaths more often. 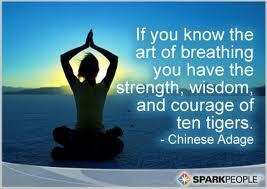 The great thing about deep breathing is you can practice anyplace! In the car, standing in line at the grocery store, sitting watching tv or reading a book. Tip for today: Sitting or standing right where you are, take a deep in-breathe. Put a hand on your belly – you want to be able to feel your belly rising. Breathe in as far as you can, then exhale slowly. Now your belly is falling back to its normal position. This is deep belly breathing. And it’s got SO many health benefits, and is SO easy to do! Begin today to benefit from this type of breathing. Your body will thank you!